Norse or Scandinavian mythology comprises the pre-Christian legends and religious beliefs of the Scandinavian people and Northern Germanic tribes, which tend to reflect a focus on physical prowess and military might. These myths were originally orally transmitted in the form of odes, sagas, and poetic epics. Knowledge of them is primarily based on two works called the Eddas and other medieval texts written down during and after the Christianization of the Norse peoples. The vast majority of written sources were assembled from accounts recorded in Iceland in the eleventh century C.E. In Scandinavian folklore, Norse mythology has long held cultural currency, and some traditions have been maintained until the present day. This rich mythological tradition also remains as an inspiration in modern literature, as well as for other forms of artwork (including visual representations, films, comic books and stage productions). Given that Norse myths and texts were repressed and persecuted under Christian rule, relatively few have survived into the modern day. However, some of these tales were recorded by Christian scholars, particularly in the Prose Edda and the Heimskringla by Snorri Sturluson (1178-1241 C.E. ), who believed that pre-Christian deities were men and women rather than devils (and would thus reveal elements of their respective culture's histories). Sturluson, who was a leading poet, chieftain, and diplomat in Iceland, condensed the extensive sagas into prose retellings that made the various tales of Norse mythology systematic and coherent. An additional source for the modern understanding of Norse mythology is the Poetic Edda (also known as the Elder Edda), which contains versions of many tales, some of which are also found in the Prose Edda. More specifically, it consists of 29 long poems, of which 11 deal with the Germanic deities, the rest with legendary heroes like Sigurd the Volsung (the Siegfried of the German version, Nibelungenlied). Although scholars think it was transcribed later than the other Edda, the language and poetic forms involved in the tales appear to have been composed centuries earlier than their transcription. Over and above the Eddas, there is also the Danish Gesta Danorum by Saxo Grammaticus, which is unfortunately of lesser utility due to the author's more extensive editorial alterations. Besides these sources, there are surviving legends in Scandinavian poetry and folklore. In the first case, mythological reference and allusion abounds in traditional Nordic (skaldic) poetry, some of which survives in runic inscriptions and in books (many of which were redacted after the golden age of this poetic form had passed). Some of these poetic and folkloric references can be corroborated with legends appearing in other Germanic literatures, for example the tale related in the Anglo-Saxon Battle of Finnsburgh and the many allusions to mythological tales in the Old English poem Deor. When several partial references and tellings survive, scholars can often reconstruct the underlying tale. Finally, the archaeological record can also be seen to provide useful clues concerning the nature of these beliefs. For instance, scholars have discovered and translated some runic inscriptions, such as the Rök Runestone and the Kvinneby amulet, that make reference to Nordic mythology. Likewise, there are also numerous runestones and image stones that depict scenes from Norse mythology, such as Thor's fishing trip, scenes from the Völsunga saga, Odin and Sleipnir, Loki with curled dandy-like mustaches and lips that are sewn together, Odin being devoured by Fenrir, and Hyrrokkin riding to Balder's funeral (the last of these is depicted on one of the surviving stones from the Hunnestad Monument). Scandinavians believed that the cosmos was divided into nine interrelated realms, some of which attracted considerably greater mythological attention. Of primary importance was the threefold separation of the universe into the realms of the gods (Asgard and Vanaheim, homes of the Aesir and Vanir, respectively), the realm of mortals (Midgard) and the frigid underworld (Niflheim), which housed Hel (queen of the underworld). These three realms were supported by an enormous tree (Yggdrasil), with the realm of the gods ensconced among the upper branches, the realm of mortals approximately halfway up the tree (and surrounded by an impassable sea), and the underworld nestled among its roots. Asgard could be reached by traversing Bifrost, a magical rainbow bridge guarded by Heimdall, the mute god of vigilance who could see and hear a thousand miles. Valhalla, Odin's hall (which is located within Asgard), can be seen as the Norse Heaven, as it is the final resting place for the souls of the greatest human warriors. To earn one's place among them, it was required that one's bravery be observed by the Valkyries, Odin's mounted female messengers whose sparkling armor supposedly created the famed Aurora Borealis (northern lights). Other less important realms include Muspell, world of burning heat and home of Surt, a giant whose skin was lava and who had hair of fire; Alfheim, world of the elves; Svartálfheim, home of the dark elves; Nidavellir, world of the dwarves, tiny men who were incomparable miners and goldsmiths; and Jotunheim, world of the Jotun or giants. The cosmology of Norse mythology also involves certain elements of duality. For example, the night and the day have their own mythological counterparts - Dagr/Skinfaxi and Nótt/Hrímfaxi, the sun (Sol) and the chasing wolf (Skoll), the moon (Mani) and its chasing wolf (Hati), and the total opposites of Niflheim and Muspell in the origin of the world and its cosmic composition. Norse cosmology postulates three separate "clans" of deities: the Aesir, the Vanir, and the Jotun. The distinction between Aesir and Vanir is relative, for the two are said to have made peace, exchanged hostages, intermarried and reigned together after a prolonged war. In fact, the most major divergence between the two groups is in their respective areas of influence, with the Aesir representing war and conquest, and the Vanir representing exploration, fertility and wealth. Some of the most important of these deities include Odin, the father god who rules the pantheon; Frigg, Odin's wife and queen of the gods; Thor, a storm god and warrior/hero; Freya, the goddess of beauty and sexual attraction; Heimdall, the far-seeing sentry of Asgard; Tyr, the god of combat; Balder, the god of spring and renewal; and, Loki, the devious trickster deity. The relative peace between the Aesir and the Vanir presents a profound contrast to their permanently stormy relations with the Jotun (Old English: Eotenas or Entas). This group, whose name is often translated as "giants" (although "trolls" and "demons" have been suggested as suitable alternatives), are generally depicted as foul, monstrous beings, comparable to the Titans and Gigantes of Greek mythology. Despite these negative associations, the gods were still seen to be relatively closely related to the Jotun, as both Æsir and Vanir continued to intermarry with the Giants (not to mention the fact that many of the gods were descendants of them). For example, Loki was the child of two giants, and Hel was half-giantess. Some of the giants are mentioned by name in the Eddas and they seem to be representations of natural forces. In addition, there are many other supernatural beings, including elves, dwarves, and monsters (including Fenrir, the gigantic wolf, and Jörmungandr, the sea-serpent (or "worm") that is coiled around Midgard). These two creatures are described as the progeny of Loki, the trickster-god, and a giantess. Along with many other polytheistic religions, this mythology lacks the predominant good-evil dualism of the monotheistic Middle Eastern traditions. Thus, Odin and Hel are not seen as pure opposites, Loki is not primarily an adversary of the gods, though he is seen to delight in causing Thor's plans to go awry. Likewise, the giants are not so much fundamentally evil, as they are rude, boisterous, and uncivilized. Thus, the dualism that exists is not an opposition of good versus evil, but order versus chaos. The origin and eventual fate of the world are described in Völuspá ("The völva's prophecy" or "The sybil's prophecy"), one of the most striking poems in the Poetic Edda. These haunting verses contain one of the most vivid creation accounts in all of religious history and a representation of the eventual destruction of the world that is unique in its combination of the themes of apocalypse and rebirth. In the Völuspá, Odin, the chief god of the Norse pantheon, has conjured up the spirit of a dead Völva (shaman or sybil) and commanded this spirit to reveal the past and the future. She is reluctant, and asks: "What do you ask of me? Why tempt me?" but since she is already dead, she shows no fear of Odin. In fact, as she begins to detail the collapse of the universe, she continually taunts him: "Well, would you know more?" Despite his evident despair, Odin insists, reasoning that if he is to fulfill his function as king of the gods, he must possess all knowledge. The poem ends when the sybil finishes revealing the secrets of creation and dissolution, at which point she returns to the underworld, leaving Odin to contemplate the traumatic future that he and the other Aesir will eventually face. According to the Scandinavians, the universe in its primordial state was a realm of fire (Muspell) and ice (Niflheim). When the warm air of Muspell hit the cold ice of Niflheim, the outline of a giant (Ymir) and the icy cow (Audhumla) were created. Slowly, the giant cow began to lick the frost off of the sleeping giant's skin, eventually freeing him from his icy prison. As Ymir slept, the continuing heat from Muspell made him sweat. He sweat out Surt, a flaming giant who went to Muspell, whose fire made him feel welcome. Later, Ymir woke and drank Audhumla's milk. But each drop of milk he spilled became a god: Odin, Vili and Ve, who proceeded to create seven more worlds and their inhabitants. 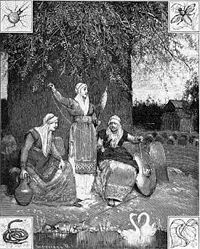 The sybil then describes Yggdrasil (the world tree that supports the realms of gods, giants and humans) and the three norns (female symbols of inexorable fate, whose names indicate the past, present, and future), who spin the threads of fate amid the tree's enormous roots. Next, she describes the additional past events, including the primeval war between Aesir and Vanir, and the murder of Baldr, Odin's handsome son. Completing this chronicle, she then turns her attention to the future. The high heat licks against heaven itself. However, some traditions (including Snorri's Edda) manage to reach an optimistic conclusion. Though the Aesir will fall, their demise will also cause chaos to be defeated and will usher in a new world from the ashes of the old one, as "in that time the earth shall emerge out of the sea, and shall then be green and fair; then shall the fruits of it be brought forth unsown." Further, many of these accounts state that the death of the Aesir frees the world and allows for the rebirth of Balder, the god of spring who returns from the dead to usher in an era of peace and plenitude. In addition to its concentration on supernatural creatures and divine realms, Norse mythological literature also relates many legends concerning human heroes and kings. These tales, often told about the founders of clans and kingdoms, possessed great importance as illustrations of national origins and as models of proper action. Thus, Norse literature may have fulfilled the same function as the national epic in other European literatures or it may have been more closely related to tribal identity. Many of the legendary figures probably existed, leading generations of Scandinavian scholars to attempt to extract history from myth in the sagas. Sometimes, the same hero resurfaces in several forms depending on which part of the Germanic world the epics survived (such as Weyland/Völund and Siegfried/Sigurd, and probably Beowulf/Bödvar Bjarki). Other notable heroes are Hagbard, Starkad, Ragnar Lodbrok, Sigurd Ring, Ivar Vidfamne and Harald Hildetand. Renowned also are the shield-maidens, who were "ordinary" women who had chosen the path of the warrior. The Germanic tribes rarely constructed large temples because the form of worship practiced by the ancient Germanic and Scandinavian people, called the Blót, were often celebrated outdoors, in sacred groves. This worship could also take place at home and at simple altars of piled stones known as horgr. However, the Scandinavian world did have a few important ritual centers, such as Skiringsal, Lejre and Uppsala, where more formalized worship was carried out. For example, Adam of Bremen, an important chronicler of the Christianization of Scandinavia, claims that there was a relatively impressive temple in Uppsala with three wooden statues of Thor, Odin and Freyr. While religious professionals seem to have existed in Norse culture, they never took on the professional and semi-hereditary character of the Celtic druidical class. This was because the shamanistic aspect of the tradition was maintained by women, the Völvas, meaning that the male ritual specialists played a more restricted role than their druidic counterparts. It is often said that the Germanic tradition of kingship evolved out of a priestly office, as the priestly role of the king was congruent with the general role of godi, who was the head of a kindred group of families and who administered the sacrifices. A unique eye-witness account of Germanic human sacrifice survives in Ibn Fadlan's account of a Rus ship burial, where a slave-girl had volunteered to accompany her lord to the next world. More indirect accounts are given by Tacitus, Saxo Grammaticus and Adam of Bremen. However, the Ibn Fadlan account is actually a burial ritual. Current understanding of Norse mythology suggests an ulterior motive to the slave-girl's “sacrifice.” It is believed that in Norse mythology a woman who joined the corpse of a man on the funeral pyre would be that man's wife in the next world. For a slave girl to become the wife of a lord was an obvious increase in status. The Heimskringla tells of Swedish King Aun who sacrificed nine of his sons in an effort to prolong his life until his subjects stopped him from killing his last son (Egil). According to Adam of Bremen, the Swedish kings sacrificed male slaves every ninth year during the Yule sacrifices at the Temple at Uppsala. The Swedes had the right not only to elect kings but also to depose them, and both King Domalde and King Olof Trätälja are said to have been sacrificed after years of famine. Finally, as Odin was associated with death by hanging, a possible practice of Odinic sacrifice by strangling has some archeological support in the existence of bodies perfectly preserved by the acid of the Jutland (later taken over by Danish people) peat bogs, into which they were cast after having been strangled. An example is Tollund Man. However, as we possess no written accounts that explicitly interpret the cause of these stranglings, they could have other explanations. An important problem in interpreting Norse mythology is that often the closest accounts that we have to "pre-contact" times were written by Christians. The Younger Edda and the Heimskringla were written by Snorri Sturluson in the thirteenth century, over two hundred years after Iceland became Christianized. Thus, Snorri's works likely carry a large amount of Christian bias in their interpretation of Norse myths. One gruesome form of execution occurred during the Christianization of Norway. King Olaf Tryggvason had male völvas (practitioners of traditional forms of Viking shamanism, sorcery, prophecy) bound in stout ropes and left on a tidal skerry to drown. Trying to avert civil war, the Icelandic parliament voted in Christianity, but for some years tolerated heathenry in the privacy of one's home. Sweden, on the other hand, had a series of civil wars in the eleventh century, which ended with the burning of the Temple at Uppsala. In England, on the other hand, Christianization occurred earlier and sporadically, rarely by force. Conversion by coercion was sporadic throughout the areas where Norse gods had been worshipped. However, the conversion did not happen overnight. Christian clergy did their utmost to teach the populace that the Norse gods were demons, but their success was limited and the gods never became evil in the popular mind in most of Scandinavia. Two centrally located and far from isolated settlements can illustrate how long the Christianization took. Archaeological studies of graves at the Swedish island of Lovön have shown that the Christianization took 150-200 years, which was a fairly extended period, given that this was a location in close proximity to both secular and religious authorities. Otherwise there are few accounts from the fouteenth to the eighteenth century, but the clergy, such as Olaus Magnus (1555) wrote about the difficulties of extinguishing the old beliefs. In the nineteenth and early twentieth century Swedish folklorists documented what commoners believed, and what surfaced were many surviving traditions of the gods of Norse mythology. By then, however, the traditions had been sufficiently decontextualized as to have lost the cohesiveness attested to in Snorri's accounts. Most gods had been forgotten and only the hunting Odin and the giant-slaying Thor figured in numerous legends. Freyja was mentioned a few times and Baldr only survived in legends about place names. The gods of Norse and Germanic mythology have left numerous traces in elements of everyday life in most Western countries (especially those who use a Germanic language). An example of this is found in some of the names of the days of the week, which were formerly modeled in Latin after the planets (e.g. Sun, Moon, Mars, Mercury, Jupiter, Venus, Saturn) but eventually some of the names (i.e. for Tuesday through to Friday) were replaced with the names of divine Germanic equivalents (see table inset). Other elements of Norse mythology survived into modern times such as the Norse belief in destiny has been very firm until modern times. Since the Christian hell resembled the abode of the dead in Norse mythology one of the names was borrowed from the old faith, Helvíti i.e. Hel's punishment. Some elements of the Yule traditions were also preserved, such as the Swedish tradition of slaughtering the pig at Christmas (Christmas ham), which originally was part of the sacrifice to Freyr. 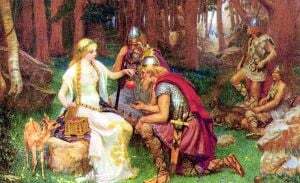 The nineteenth and twentieth centuries have seen attempts to revive the old Germanic religion in both Europe and the United States under various names, including Ásatrú ("Aesir Faith"), Odinism, Wotanism, Forn Sed ("Old Custom") or Heathenry. 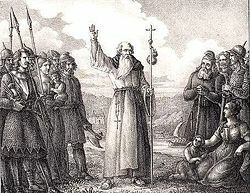 In Iceland, Ásatrú was recognized by the state as an official religion in 1973, which legalized its various ceremonies (e.g. marriage and child-naming). It has also become an official and legal religion in all the Nordic countries. The romanticism surrounding Norse mythology among American and European intellectuals also impacted popular culture. For instance, Richard Wagner's Ring Cycle (Der Ring des Nibelungen) is heavily based upon Norse mythology, including tales of Odin, Frigga, Loki, the Valkyries, and Ragnarok. Subsequently, J.R.R. Tolkien's The Lord of the Rings was also heavily influenced by the indigenous beliefs of the pre-Christian Northern Europeans. As that work became popular, elements of its fantasy world moved steadily into popular perceptions of the fantasy genre. In fact, nearly any modern fantasy novel contains such Norse creatures as elves, dwarves, and frost giants. In this way, Norse mythology has been largely (though indirectly) responsible for the development of an entire literary genre. Finally, Norse figures and concepts are frequently found in such diverse media as Japanese animation, video games, and comic books (for example, Marvel Comics Thor). ↑ Some scholars have speculated that this tale symbolized the way the gods of invading Indo-European tribes supplanted older nature-deities of the aboriginal peoples, although it should be firmly noted that this is conjecture. Other authorities (compare Mircea Eliade and J. P. Mallory) consider the Aesir/Vanir division to be simply the Norse expression of a general Indo-European division of divinities, parallel to that of Olympians and Titans in Greek mythology, and in parts of the Mahabharata. More specifically, Georges Dumézil, one of the foremost authorities on the Norse tradition and a noted comparitivist, argues quite persuasively that the Aesir / Vanir distinction is a component of a larger triadic division (between ruler gods, warrior gods, and gods of agriculture and commerce) that is echoed among the Indo-European cosmologies (from Vedic India, through Rome and into the Germanic North). Further, he notes that this distinction conforms to patterns of social organization found in all of these societies. See Georges Dumézil's Gods of the Ancient Northmen (especially pgs. xi-xiii, 3-25) for more details. ↑ Snorri Sturluson, Gylfagining (LI), page 81 in Brodeur's translation. ↑ Snorri Sturluson, Gylfagining (LIII), page 83 in Brodeur's translation. ↑ Munch, 13; Orchard, 45-47. Turville-Petre notes that these beliefs are "strongly influenced by Christian eschatology and symbolism, but the dim hope that the beloved god would one day return did not derive from Christianity alone. After the death of Eirik Blood-axe, about the middle of the tenth century, his widow commissioned a memorial lay, in which the poet described how Odin and his warriors welcomed Eirik in Valhalla. As the dead king approached, the benches creaked, as they would if Balder were returning. ↑ ibn Fadlan, An Excerpt from the Risāla, Describing the Funerary Customs of Swedish Vikings on the Volga (A.D. 921-2), translated by H. M. Smyser. Accessed online at: Risala: Ibn Fadlan's Account of the Rus Retrieved April 3, 2018. ↑ E. O. Gabriel Turville-Petre, Myth and Religion of the North: The Religion of Ancient Scandinavia (Praeger, 1975, ISBN 978-0837174204), 50-55, 64-70. ↑ Although both religions are of the Indo-European tradition, the sacrifice described in the Ibn Fadlan account is not to be confused with the oft-contested Hindu practice of Sati. ↑ See Magnus's extensive description in his multi-volume "Description of the Northern Peoples," translated by Peter Fisher and Humphrey Higgens, edited by Peter Foote; with annotation derived from the commentary by John Granlund. (London : Hakluyt Society, 1996-1998). ↑ See, for example, Anne-Sofie Gräslund's "New perspectives on an old problem: Uppsala and the Christianization of Sweden" in Christianizing Peoples and Converting Individuals (Turnhout: Brepols, 2000) and Béla Harmati's The Church and Civil Religion in the Nordic Countries of Europe, (Geneva, Switzerland: Lutheran World Federation, 1984). The Prose Edda Retrieved April 3, 2018. The Poetic Edda Retrieved April 3, 2018. Gesta Danorum Retrieved April 3, 2018. Ynglingasaga Retrieved April 3, 2018. Armstrong, Fredrick and Dave Puls. It Came From Animatus. Rochester, NY: Animatus Studio, 2004. DVD. Includes The Derf: The Viking Trilogy, a cartoon series featuring the Norse gods. Retrieved April 3, 2018. Sacred Texts: The Children of Odin. (Illustrated.) Retrieved April 3, 2018.
d'Aulaire, Ingri and Edgar. "d'Aulaire's Book of Norse Myths." New York: New York Review of Books, 1967. Baldwin Project: The Heroes of Asgard Retrieved April 3, 2018. Baldwin Project: Norse Stories Retold from the Eddas Retrieved April 3, 2018. Sacred Texts: Teutonic Myth and Legend. Retrieved April 3, 2018. Rydberg, Viktor. Teutonic Mythology, trans. Rasmus B. Anderson. London: Swan Sonnenschein & Co. Reprinted 2001, Elibron Classics (ISBN 1402193912). Reprinted 2004, Kessinger Publishing Company (ISBN 0766188914). Davidson, H. R. Ellis. Scandinavian Mythology. London and New York: Hamlyn, 1969. ISBN 0872260410. Reissued 1996 as Viking and Norse Mythology. New York: Barnes and Noble. Grimm, Jacob. Teutonic Mythology, 4 vols. Translated by S. Stallybras. London. Reprinted 2003, Kessinger (ISBN 0766177424, ISBN 0766177432, ISBN 0766177440, ISBN 0766177459). Reprinted 2004 Dover Publications (ISBN 0486436152 (4 vols. ), ISBN 0486435466, ISBN 0486435474, ISBN 0486435482, ISBN 0486435490). Simrock, Karl Joseph. Handbuch der deutschen Mythologie. 1853–1855.